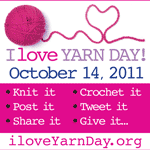 National I Love Yarn Day! 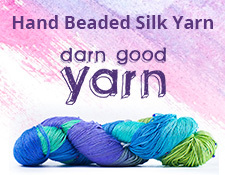 What is your favorite yarn? Why do you like it? I love to hear what you have to say. Right now my favorite yarn is Malabrigo Rios. I love the feel and the fact that is machine washable. I love tweed yarns. Cascade 220 tweed is my first love. Tweed yarn has such a lovely luxury to it. Very nice! Cascade 220 has been my go-to reliable workhorse, though I may have to rethink that with the recent huge price increase. I'm a sucker for pretty much any indie sock yarn –my most recent love there is the Out of Step Dyeworks line.